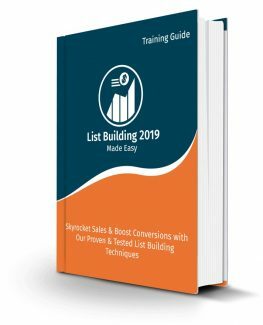 Welcome to the latest and very easy to apply “List Building 2019” Training, designed to take you by the hand and walk you through the process of getting the most out of your List in 2019, on behalf of your business. This training is comprised of 20 Chapters, ready to show you the latest List Building strategies for 2019. - Chapter 1: What Is List Building All About? Well, it’s time for you to start getting the most out of your list in 2019, on behalf of your Business. Hey there everyone! Welcome to our newest online training series, where we are going to teach you how to help your business grow with a classic marketing strategy: list building. You have surely heard about how growing a big list of potential customers that you can get in touch with can benefit your business, but what we’ve found is that most experts have a hard time explaining what exactly list building is all about, so let us grab you by the hand to teach you how to do list building the easy way in 2019 and beyond! and nurturing a list of contacts that can potentially become your customers. Usually, these lists are built by using a variety of marketing strategies that often involve collecting lead info from sources such as business directories. So when leads sign up to your email list to get a free download, or to get access to more content, they agree to be added to your list, and to receive marketing emails from you or from your business.